Preheat your oven to 180C/350F/Gas Mark 4. Line an appropiate sized tin with the paper cases of the size cupcakes you wish to make (i.e. muffin tin lined with muffin cases). Melt the chocolate in a heatproof dish set over a simmering pan of water (or in the microwave making sure you don't allow it to burn). Once melted set aside and allow to cool slightly (but not become solid). Beat the butter and sugar together in a bowl until light and fluffy. Gradually beat in the eggs. Sift in the flour, baking powder and salt into the mixture and fold together with a metal spoon. Fold the orange rind into the mixture. Check that your chocolate has cooled, then add it to your mixture and fold in again. Divide the batter between the cases, filling each one to about two-thirds full. Bake in the oven for 15-20 minutes (less if you're making the mini cupcakes) or until risen and springy to the touch (a skewer poked through the middle of one should come out clean). Leave to cool slightly in the tin before removing to a wire rack and allowing to cool fully (this is very important as otherwise the icing will melt and run off them). While the cakes are cooling you can make the icing. Whisk together the icing sugar, cocoa powder and butter in a clean bowl until the mixture resembles fine breadcrumbs. Add the orange juice and zest and whisk at a high speed for several minutes until light and fluffy (the longer you whisk the fluffier the icing you'll get). Divide the icing between the cold cupcakes. You could decorate the tops with little orange sweets, edible orange glitter, candied orange peel or pieces of Terry's Chocolate Orange if you're really feeling decadent! Mine sadly didn't last long enough to properly decorate and photograph nicely... 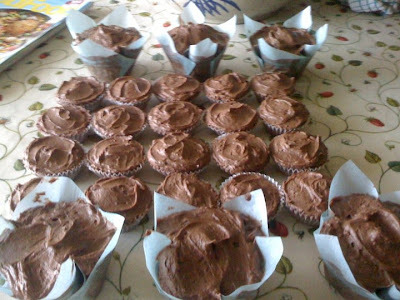 I will be making them again (for a party or something, not for us to sit down and eat on our own in an evening!) and will decorate them properly then and update the photo!